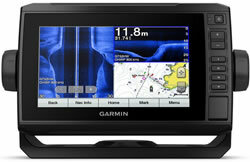 Find a Chartplotter and transducer for your boat or yacht. 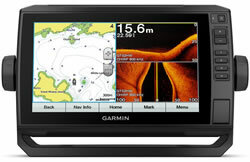 To make buying a transducer easier, we have an online form that you can complete to send us details of your marine chartplotter and boat set up. We will then reply to you with the correct transducer to buy. Complete the Transducer Selection Form. Alternatively, if you know which transducer your require you can view the comprehensive range of transducers available buy from ActiveGPS. 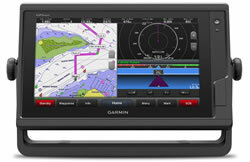 You have a choice of BlueCharts to use with your Garmin GPS Marine Chartplotter. You can either buy g3 or g3 Vision. Both g3 and g3 Vision charts offer the same, identical area of map coverage. 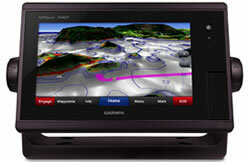 The difference between g3 and g3 Vision is that g3 Vision includes extra features which are popular among mariners. These additional features include Auto Guidance for routing from point A to B. Overhead port plans are also available with the g3 vision. 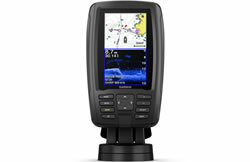 With a transducer (sold separately) you can use ClearVu and SideVu to see below your boat and to the side of your boat underwater, if you buy the XSV model (GPSMAP 1222 and 1022) or XS model (GPSMAP 922 and 722). 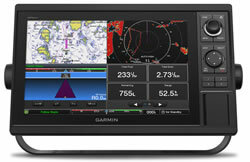 Some standalone chartplotters also have the ability to add sonar and some include a sonar. Sonar helps to measure the depth of water and can also be used as a fish finder. If you'd like to add this feature then you'll need to be looking at model numbers ending with an 's' such as the 451s and 750s. Where the 's' stands for sounder. 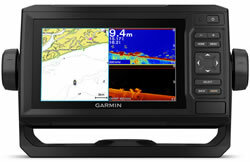 The models ending in DV (Garmin Down Vu) also provide a view below the water. Please note however that the sounders sonar capabilities will not work without buying/adding a transducer. There are three types of transducer which are transom (for outboard powerered motor boats), in-hull (for single skin fibre glass boats) and through-hull (for wooden and steel boats). If you are unclear what transducer to buy, please see our online guide and online form for us to recommend which transducer to buy. 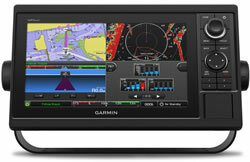 Do you own an older Garmin marine chartplotter or GPS device? Looking for accessories? 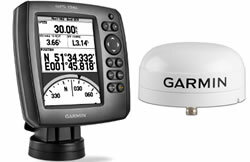 Garmin echoMAP series, namely the Garmin echoMAP 42dv, Garmin echoMAP 43dv, Garmin echoMAP 44dv, Garmin echoMAP 45dv, Garmin echoMAP 50dv, Garmin echoMAP 50s, Garmin echoMAP 52dv, Garmin echoMAP 53dv, Garmin echoMAP 54dv, Garmin echoMAP 55dv, Garmin echoMAP 70dv, Garmin echoMAP 70s, Garmin echoMAP 72sv, Garmin echoMAP 75sv, Garmin echoMAP 92sv and Garmin echoMAP 95sv. 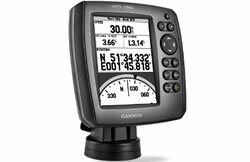 Garmin echoMAP CHIRP series, namely the Garmin echoMAP CHIRP 52dv, Garmin echoMAP CHIRP 53dv, Garmin echoMAP CHIRP 54dv, Garmin echoMAP CHIRP 55dv, Garmin echoMAP CHIRP 75dv, Garmin echoMAP CHIRP 75sv and Garmin echoMAP CHIRP 95sv. 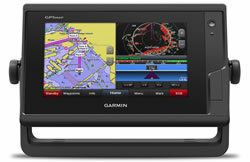 Garmin GPS series, namely the Garmin GPSMAP 158/158i, Garmin GPS 60, Garmin GPS 73. 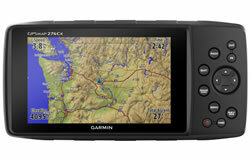 Garmin GPSMAP series, namely the Garmin GPSMAP 420/420s, Garmin GPSMAP 451/451s, Garmin GPSMAP 521/521s, Garmin GPSMAP 527/527s, Garmin GPSMAP 547/547s, Garmin GPSMAP 551/551s, Garmin GPSMAP 556/556s, Garmin GPSMAP 557/557s, Garmin GPSMAP 620, Garmin GPSMAP 640, Garmin GPSMAP 720/720s, Garmin GPSMAP 721/721s, Garmin GPSMAP 740/740s, Garmin GPSMAP 7407/7407xs, Garmin GPSMAP 741/741s, Garmin GPSMAP 750/750s and Garmin GPSMAP 751/751s.